Some Tesco Everyday Value Spaghetti Bolognese contains 60% horsemeat, DNA tests by the retailer have found. Romania has rejected claims that it was responsible for wrongly describing horsemeat from its abattoirs as beef. Tesco took the frozen bolognese off the shelves when it found out Findus was concerned about the source of its meat processed by Comigel, based at Metz, north-eastern France. 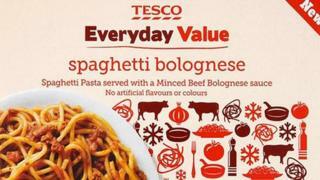 Media captionEnvironment Secretary Owen Paterson: "This appears to be an issue of fraud and mislabelling"
Tesco Group technical director Tim Smith said: "The frozen Everyday Value Spaghetti Bolognese should contain only Irish beef from our approved suppliers. The source of the horsemeat is still under investigation by the relevant authorities. "We are very sorry that we have let customers down." Mr Paterson told MPs he had called in representatives of all Britain's producers, retailers and distributors and "made it clear" he expected to see immediate testing of all processed beef products across the supply chain. "and that they let the FSA know as soon as they become aware of a potential problem in their products." In the Commons, Labour's Mary Creagh accused Mr Paterson of being too slow to respond as incidents emerged. "The secretary of state had to be called back to London from his long weekend to deal with the crisis." she claimed. "Until Saturday's panic summit, he hadn't actually met the food industry to address this crisis." News of the tests came after the Romanian Prime Minister earlier on Monday denied two abattoirs in his country sold horsemeat purported to be beef to European food companies. Seven French supermarkets have withdrawn frozen ready-meals made by Findus. And on Monday night, one Dutch supermarket chain took the Prima Frost brand of lasagne produced by Comigel off the shelves, amid fears it may contain horsemeat. The poll was conducted by the market research company Kantar. Mr Paterson said he would meet with his European counterparts and the European Commissioner for Health and Consumer Policy Tonio Borg later this week in the wake of the scandal. "At the moment this appears to be an issue of fraud and mislabelling. "But if anything suggests the need for changes to surveillance and enforcement in the UK we will not hesitate to make those changes," he said.